St Andrew was born into a poor pagan family in Bac-Ninh, North Vietnam. At 12yrs, his family moved to Hanoi, the capital city, to find work. There they found food and shelter among Christians. St Andrew was luckily able to pursue an education and chose to be baptised a Catholic. He studied theology and at first, became a Catechist and then a Priest. He was tireless in his preaching and pastoral care while living a simple pious life. St Andrew was imprisoned for his religious conviction and exercising his clerical duties but released following donations from his community. 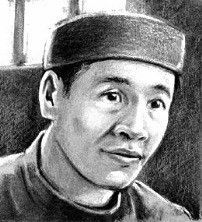 In 1839, he was again arrested, having visited an imprisoned fellow Vietnamese Priest, Peter Thi, to hear his confession. Again donations liberated him and Peter Thi but their freedom was short-lived; they were soon rearrested, severely tortured and executed. In many ways, St Andrew represents, not only the 117 similarly martyred Vietnamese Saints for their faith but the estimated 130,000 Christians who were persecuted and died in Vietnam between 1625 and 1886. Today, there are more than six million Catholics in Vietnam and the number is growing; the rewards of Andrew Dung-Lac, the 117 other shepherds and the unrecorded executed thousands. St Andrew Dũng-Lạc & Companions Feast Day is the 24th November. Pray that we will go about our daily work, solely out of love for Jesus and in dedication to His service.